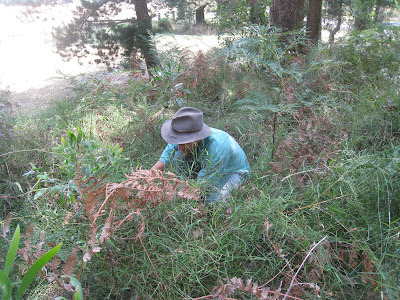 Our goal is to systematically reduce the incursion of woody weeds in the landscape of Trentham township through voluntary community participation. 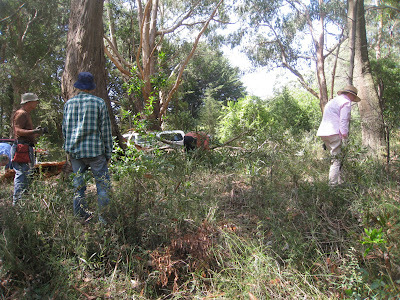 Working on gorse removal at Racecourse Rd. Holly is the first of our BIG FOUR environmental weeds to be discussed by WeedFree Trentham over four issues of the Trumpet. Just about everyone will be familiar with holly. It's one of those iconic Northern Hemisphere trees and is affectionately associated with Christmas. In this "neck of the woods", its beautiful red berries, borne only on female plants, have been looking pretty over the last month. Birds, especially blackbirds, distribute the seed far and wide in bushland and in your garden. Holly is considered a noxious weed in NSW, Victoria, Tasmania and South Australia. It naturalises and thrives in cool, higher rainfall areas. Little wonder it lovesTrentham! In bushland its large dense stature shades out places where native plants would otherwise germinate and grown in gardens it compromises the integrity of a good garden design, germinating randomly. If the ground is moist, small holly plants can be hand pulled quite easily. Getting a garden knife or trowel under the plants will help or, if larger, a spade. Bigger plants or small trees may require a method involving herbicide, remembering Roundup is most effective when plants are actively growing. The most efficient practice is "cut and swab". The plant is cut off as low to the ground as possible and neat Roundup (preferably Biactive) is applied immediately to the cut stem before the sap has a chance to dry. It is imperative to be familiar with and follow the instructions provided with Roundup which is recommended only where other methods are impracticable. Speak to your favourite nurseryman, or give us a call if you'd like a recommendation for better planting options for your garden or methods of dealing with mature holly trees. 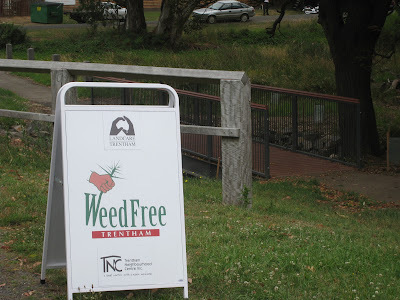 WeedFree Trentham meets monthly, on the fourth Saturday afternoon, to counter the woody weed incursion into our area give us a Hoy if you would like to join us.